It is just over 500 steps to the top of the UNESCO-listed bell tower of the Sint Romboutskathedraal for excellent views of Mechelen and northern Belgium. The belfry of the St Rumbold ‘s Cathedral in Mechelen is just shy of 100 m while just more than 500 steps get visitors to the top with a modern skywalk offering spectacular views of the old town, surrounding countryside, as well as the skylines of Brussels and Antwerp. The medieval Gothic tower of the cathedral was never completed – a decorative steeple was supposed to have added another 60 m or so. However, the tower is still included – with more than 50 other belfries in Belgium and France – on the UNESCO World Cultural Heritage list. The foundation stone for the belfry of the St Romboutskathedraal in Mechelen was laid on 22 May 1452 (although no one now knows where this particular stone is). However, work progressed slowly, which is fortunate, as the upper parts of the tower built after 1482 could incorporate a more decorative High Gothic design. The contrast with the more austere lower floors is quite stark. Without computer simulations, but with the benefit of the unfortunate experiences of other towns, Mechelen built the tower structurally separate from the similarly named church. Structurally, the two buildings are just weakly linked to prevent the tower from pulling the church apart should it start to lean or even collapse. A fire in 1498 destroyed the wooden bell frames in the tower with the heat so intense that some of the bells melted. Worse was the fire of 1687. Late night, en route home from a pub, a citizen noticed the belfry on fire. He raised the alarm and the locals stormed up the tower to form a water bucket chain just to discover that the fire was in fact the moon shining through the stained glass. 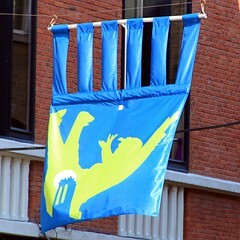 Despite a pertinent call by the mayor to not let this embarrassment spread across the city border, the inhabitants of Mechelen soon found themselves called theManeblussers (Moon Extinguishers) – a name still used today. In local event posters and flags, the tower is thus usually drawn with a full moon in the background. Work on the tower halted around 1520. The planned slender 60 m spire was never built. At 167.5 m, the Mechelen tower would have been the tallest in Europe – even taller than the neo-Gothic tower in Ulm. Fear of a collapse, as has happened elsewhere, probably brought an end to the building work and later money would be an issue. In 1985, Pope John Paul II visited Mechelen and was overheard saying the tower is incomplete. However, rather than adding the spire, Mechelen built a modern glass-and-steel skywalk on top of the tower in 2009. 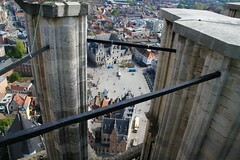 It is 97.30 m, or 538 steps to the top of the belfry of Mechelen Cathedral with its Skywalk and wonderful views. En route, six chambers allow visitors to regain composure without loosing too much dignity during the climb to the top. Almost a third of the way up, most visitors are happy to take break and catch some breath. 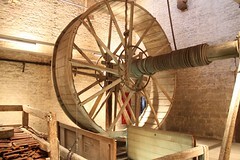 In this room, the human powered crane was installed to haul wood, stones, and other building material up in the tower. The 5-m wooden wheel allowed up to three people to power walk the crane. A further delight is being able to look down into the church through the opening in the dome that allowed material to be hoisted up. 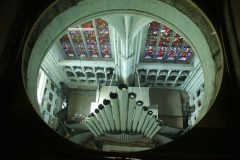 It is not often that organ pipes can be admired from the top down. A good 70 steps higher is the Forge Chamber – a few iron bars and limestone pieces remind of its original purpose as the smith shop for repairing the clock, carillon and other metalwork and minor repairs. From here, it is still possible to look down into the church but the view from the crane chamber is much better. 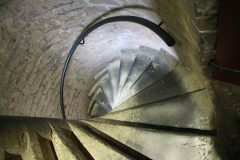 It is a fair number of stairs to the next stops where things get more interesting – the bells, carillon and clock of the Rumbold belfry. 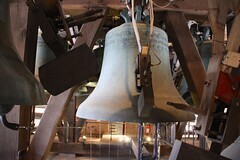 The weights of the bells range from 16 kg to 8 tons. Up to 1923, the cathedral had 18 bell ringers prior to electricity taking over. The St Rumbold’s Tower is the only belfry in Belgium with two carillons – it has two sets of 49-bells each. (Antwerp Cathedral has space for two carillons but always seems to be a few bells short.) 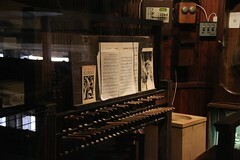 Visitors can see both sets as well as the wooden keyboard used to play the carillon, when not set to automatic. Mechelen has a dedicated Carillon school (Beiaardskool) and concerts are frequently held – free as you can hardly box in the sound. The enormous 18th-century drum in the clock chamber was recently restored – it is set to play a tune on the carillon every 7.5 minutes. Away from the excitement of the bells, it is another steep climb to the ash cellar. This chamber was intended to be used for the construction of the 60 m steeple, which was of course never added to the tower. Ash was used colloquially as an alternative name for mortar, which was stored here in copious amounts. Climbers soon pass step 500 and then emerge in the clear daylight before a final set of modern glass stairs leads to the skywalk. This panoramic platform at the top of the tower was completed in 2009 and gives wonderful views of the surrounding countryside. From the top of the tower visitors can see the skyline of both Brussels and Antwerp – these cities are only 20 km from Mechelen. Closer by, the roofs of the old town and the outdoor cafés on Grote Markt look almost like Lego toy constructions. The belfry of the town hall was similarly never completed but also on the UNESCO World Cultural Heritage list. Note the large number of churches in the old town – at least eight are open to visitors in the afternoons and many are filled with art. From here, it is another 538 steps down to the church floor. It is possible to stop again at the chambers seen en route to the top but going down in one go is not too strenuous compared to the climb. Admission to Mechelen Cathedral is free but climbing the tower is €7 for adults and €2.50 for visitors 3 to 26 years old. Family tickets are €16. The tower is open from 1 to 6 pm (last admission at 4:30 pm). 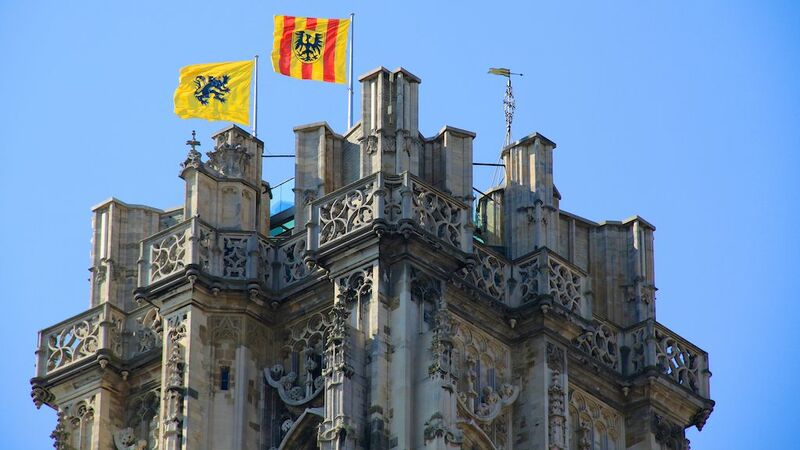 The tower is closed on Wednesday (previously closed on Mondays, as the non-Dutch website of even the tourist information office still indicates). Reservations through the tourist office are possible or online (Dutch only) – a good idea at busy periods, as only 20 people are admitted every 20 minutes. 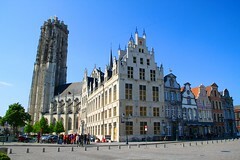 Eight Historic Mechelen Churches – free and full of art, including Rubens triptychs. More photos of Mechelen on Flickr.